One of the principal traits of successful persons is teachability. 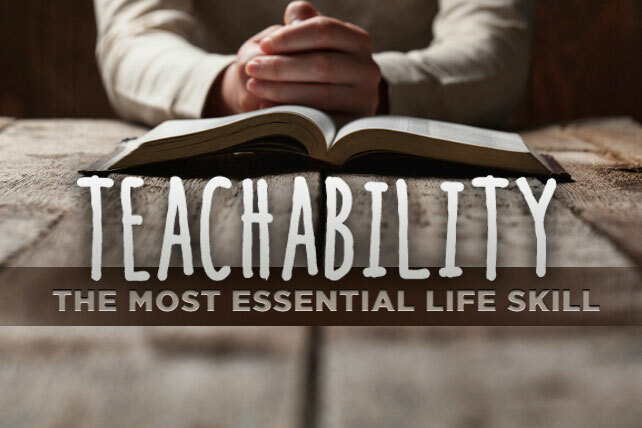 Why is teachability such an important trait? There are so many people I have known in life who have attained high degrees, have great schooling but are not teachable. When you ask them the answer is “I know it”, “I have studied it”…. However, they never take the step to learn what is new. If a person does not have the initiative to be teachable, they are left behind and soon find themselves working backward. They are not sure why success is eluding them, but if you talk about teachability, they are not willing to admit that they need any further knowledge or teaching. As we know the world is changing, job market, the way we do business is changing very fast. The jobs that were there 70’s and 80’s changed with the advent of computer in 90’s. With so much progress, even the jobs in 90’s and early 2000’s have changed. The way we do business, studying, schooling all has changed. To succeed now and today’s business environment you need to learn the cutting edge technologies or have knowledge of them and then hire the right people to do the job for you. Even selling has completely changed. Internet sales have changed the habits of people. Amazon in particular has affected sales worldwide. This again comes to the age where almost everyone has used the aspect of teachablity and jumped on this bandwagon. Now the leadership aspect of business is changing. If you are leading from past knowledge and you have new millennials working, there is bound to be a conflict. You need to become the leader of the new generation and understand their needs. This generation is not stuck like our grandparents to one job, where the job will take care of the family and then the retirement. Even secure jobs, in one era, like government jobs are not fancied by the new generation who do not care much for job security. Now if you need to keep these fast-paced workers working at their best you will need to invest in coaching and leadership training. To me teachabilty has been an important aspect of life. I have always strived to be teachable and learn from everyone. My seniors, my peers, my direct reports, everyone. If you have a teachable mentality then everyone has something to offer you. Keep an open mind, ego in check, speak less and listen more. After completing my MBA almost 28 years ago I have kept myself on a learning track every single year. I am voracious reader and have built myself a library of great resources. I have kept myself teachable. Learning computers, web-designing and opening new businesses became my passion. After that I became a Certified Hypnotherapist as I loved to learn how the mind works, I learned NLP (Neuro Linguistic Programming). Read many wonderful books on that. Learned Mindmapping and so much more. This helped me open many businesses over course of years and learn across industries and apply the principles in other businesses. Recently a couple of years ago I wanted to realize my passion of teaching and coaching. To heighten this I took on a journey and became a John Maxwell certified Coach, Teacher, Trainer and Speaker. To do this I had to sacrifice my recreation time, family time and spent many long night and weekends. I kept on going consistently with single focus until I had mastered what I needed. It was not easy but that gave me the tools to become the best and then I started Mastermind courses, had speaking engagements, workshops and so much more. I am not trying to impress you but impress upon you that taking these actions took me closer to my passion and my goals and I started attracting the right people, who then guided me in the right direction and gave me the right resources. All this happened as I had kept myself teachable and learned from every instance possible. If you keep yourself teachable, then the law of attraction starts working in your favor. You will start to attract the right people, a right job, right contacts for business; it will keep you moving towards your freedom. Never say, I know it all. Keep an open mind and open spirit towards learning. A mind that is stretched by a new experience, never goes back to its old dimensions.